Blowout Sale! Save 69% on the HP 5130 48G PoE+ 4SFP+ 1-slot HI Switch JH326A by HP at Pacs BG. MPN: JH326A. Hurry! Limited time offer. Offer valid only while supplies last. The HPE FlexNetwork 5130 HI Switch Series delivers scalability and resiliency at the access layer of medium and large enterprise campus networks. The HPE FlexNetwork 5130 HI Switch Series delivers scalability and resiliency at the access layer of medium and large enterprise campus networks. 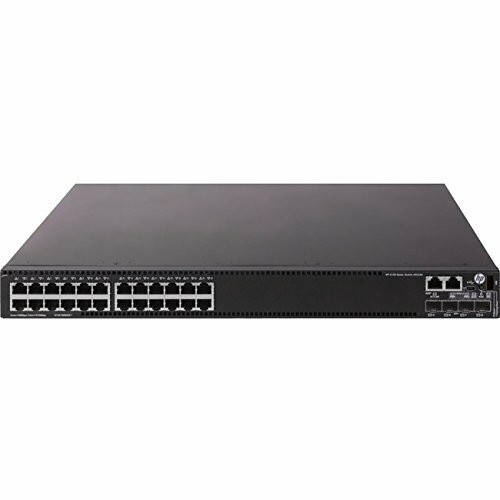 This FlexNetwork switch supports enterprise class QoS and security, HPE Intelligent Resilient Framework (IRF) stacking, static Layer 3 routing and RIP, dual redundant power supplies, fixed and modular 10GbE uplinks ports, PoE+, ACLs, IPv6 and delivers energy savings with Energy Efficient Ethernet. The 5130 HI Switch Series can be managed with HPE Intelligent Management Center (IMC) Software for a single view of your entire network. The HPE FlexNetwork 5130 HI Switch Series delivers scalability and resiliency for medium and large enterprise networks. It supports stacking, dual power supplies; 10GbE uplinks; static and RIP routing; PoE+; ACLs; IPv6 and power savings. Offers scalable stacking and backhaul capacity with four fixed 10GbE uplinks and slots for two more 10GbE uplinks, including support for 10GBASE-T.
Dual, redundant, hot-swappable power supplies keep your network up and running and deliver up to 1440 Watts of PoE+ for powered cameras, phones and wireless access points.